Legendary professional f/2.8 wide-angle zoom lens. With a fast fixed maximum aperture of f/2.8, the exceptional AF-S Zoom-NIKKOR 17–35mm f/2.8D IF-ED covers the optimal range for wide-angle photo and HD video assignments. With advanced Nikon lens technologies and optical design, it produces clear, high-contrast images throughout its entire zoom range, making the AF-S Zoom-NIKKOR 17–35mm f/2.8D IF-ED a highly reliable professional lens, in the studio and on the road. 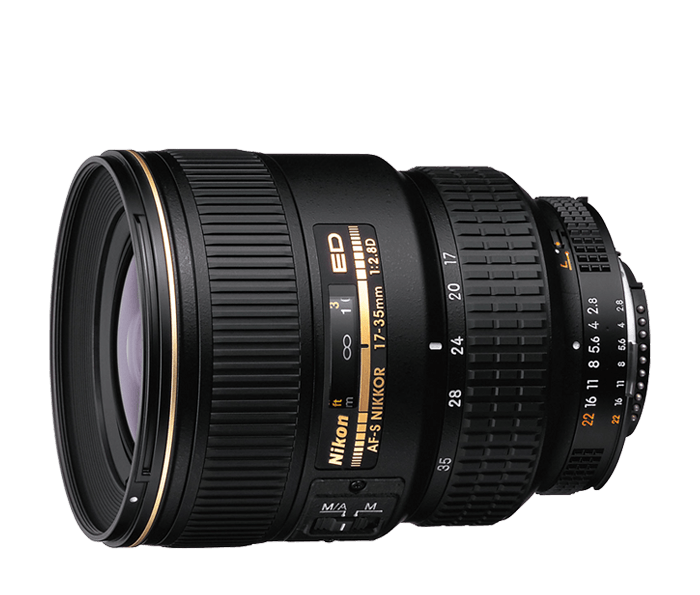 The AF-S Zoom-NIKKOR 17–35mm f/2.8D IF-ED sets the standard for wide-angle photojournalism, travel photography and HD video. Its super-fast, fixed f/2.8 aperture ensures outstanding clarity, even in difficult lighting situations, and makes it an ideal lens for candid photography, architecture, landscapes and news assignments. An advanced lens, the AF-S Zoom-NIKKOR 17–35mm f/2.8D IF-ED delivers stunning images with both FX- and DX-format NIkon D-SLRs. A host of Nikon lens features, like the chromatic abberation reducing Extra-low Dispersion (ED) glass elements and Aspherical Lens Elements (AS) and the ultra-fast, ultra-quiet Silent Wave Motor (SWM) autofocus motor deliver extremely consistent, exceptional performance in a variety of shooting situations.